The Blessing of Simple Gestures is a delightful walk into a world of encouragement  both our desire to receive it and also to share it with others. You can change your world, beginning in your sphere of influence, by letting these ideas open doors to enrich the relationships that you hold close. The truth is that we often neglect to show gratitude for or to nourish the relationships that God has brought into our journey through life. The sections of this book show how to incorporate a common item or thought to create an indelible, positive impression of hope or joy or appreciation. In a world where the message is so often negative, we need to hear a word of encouragement and hope. We need to know that we are not alone in this journey of life and that it is the relationship of friends and family that make each step an enjoyable one. So, for those of you who find it a bit of a challenge to know just how to say what is in your heart, let this book act as the catalyst that will launch you into the world of life-changing encouragers. You will find that your heart will also be encouraged. 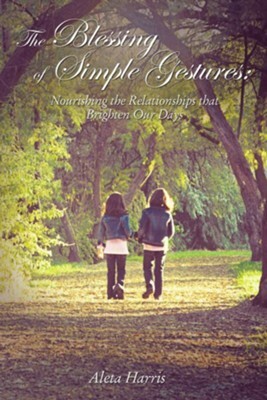 I'm the author/artist and I want to review The Blessing of Simple Gestures: Nourishing The Relationships That Brighten Our Days - eBook.